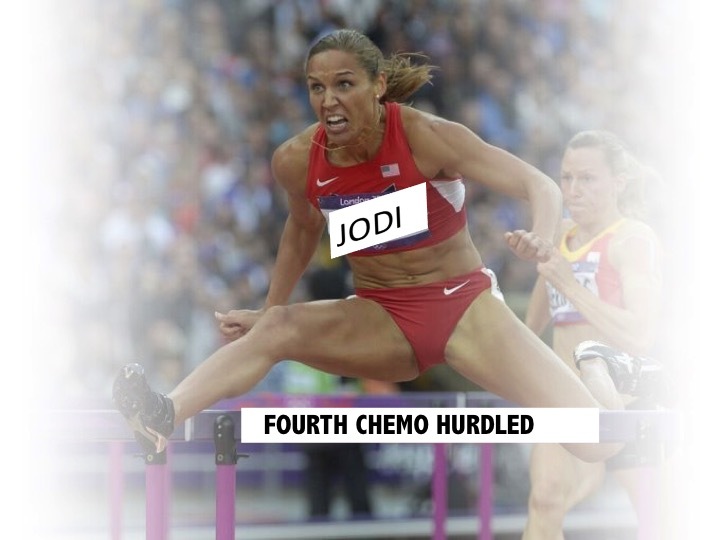 Fourth chemo in the history books, two more to go. I know processing the cumulative effects of this treatment wont be a walk in the park, and I have a pre=op surgery appoint next week because the tearduct obstruction surgery has been moved up to April 2. but I feel my cup and my eyes runneth with gratitude to the support that I get here and on my Facebook page. I think I’m up for the challenge. Thank You. Of course, I look nothing like LoLo Jones, at least not on the outside. And while I dont want you to feel pressure with “Attya girl,” comments – hitting the LIKE button on the blog or Fpage lets me know you were here! It makes a difference. Onward. Liking is easy. I’d “like” to do more – if you’ll let me. Second of all: feeling a bit more like this, perhaps? Good luck with the upcoming tear duct surgery. Hooray, four down two to go!